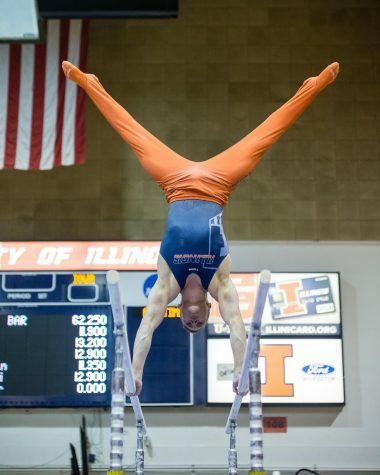 BRIAN BAUER The Daily Illini Brandon Ngai swings on the pommel horse in the meet against Minnesota at Huff Hall on Jan. 28. 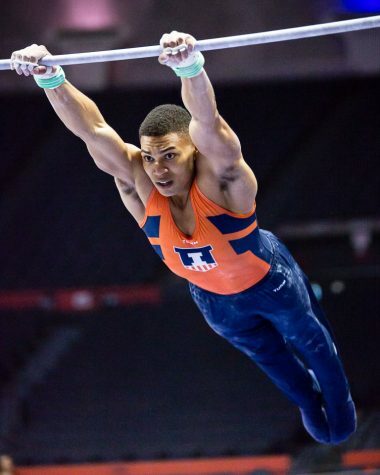 Illinois finished third at the NCAA championships, with Ngai taking the pommel horse title with a score of 14.825. 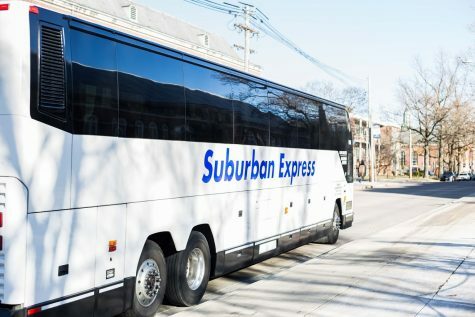 All season long, head coach Justin Spring spoke of looking for consistency from his team, and he finally got that performance during postseason play. 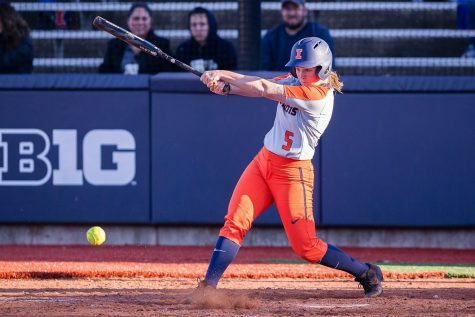 The Illini started the season strong, winning their first 11 meets of the year before suffering four-consecutive defeats leading up to the Big Ten championships in Champaign. 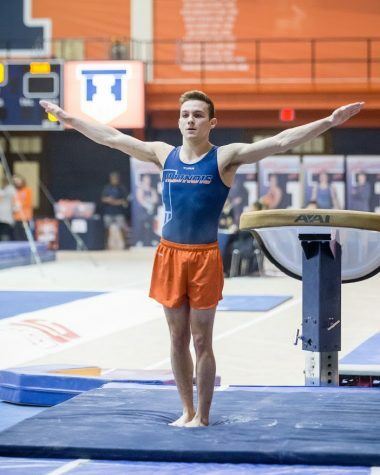 During the second meet of the season, Illinois recorded a team-high score at Arizona State. Illinois finished with 422.900 team points, leading the entire duration of the meet. This accomplishment occurred just one week after winning the Windy City Invitational. 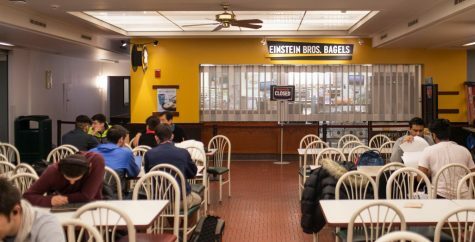 Illinois defeated eventual Big Ten champion Ohio State, Michigan, Minnesota, Iowa and host UIC. 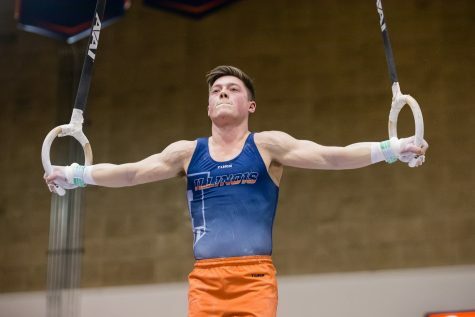 Illinois overcame injuries to key contributors, finishing second in the conference and then third in the country weeks later at the NCAA championships in West Point, New York. 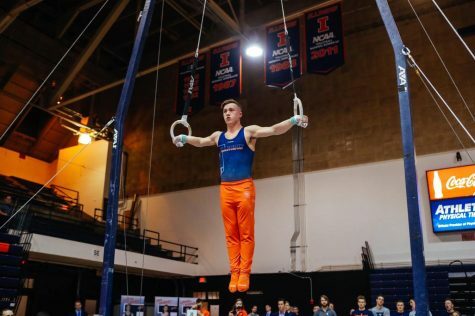 Junior Brandon Ngai, sophomore Johnny Jacobson and sophomore Alex Diab won three of six Big Ten event titles at the State Farm Center. 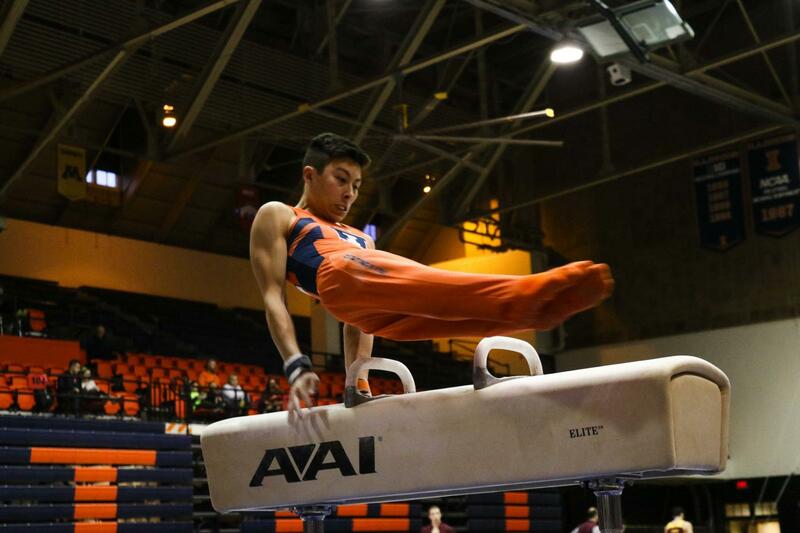 Ngai took the pommel horse title with a 14.825. 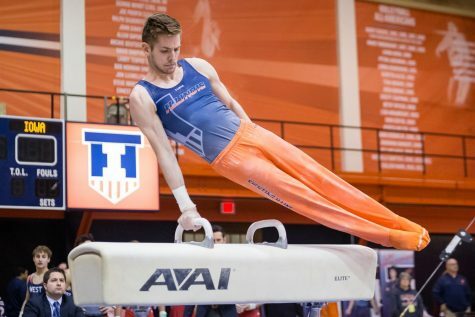 The event specialist – and defending NCAA champion – had the highest score on pommel horse during the team competition as well. 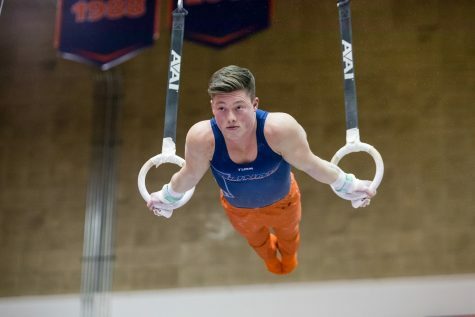 During the championship meet, four gymnasts — junior Bobby Baker, redshirt junior Chandler Eggleston, Diab and Ngai — earned six total All-American honors. 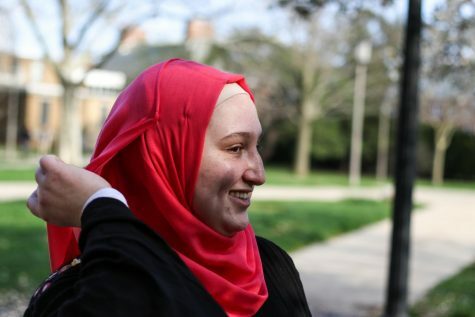 Diab was recently chosen to represent the U.S. at the 2017 World University Games, coming off a second-consecutive Big Ten title on the still rings. 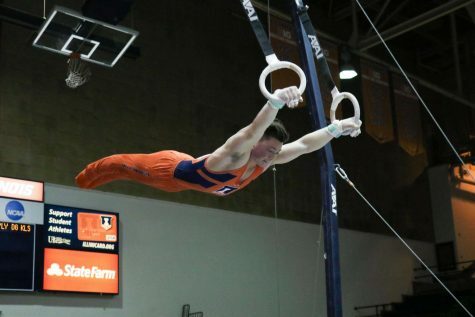 The Glen Ellyn, Illinois, native also finished second in conference on floor. For his accomplishments, the University Athletic Department nominated Diab as a finalist for the Dike Eddleman Male Athlete of the Year award. The winner is announced in June after the completion of all spring sports. 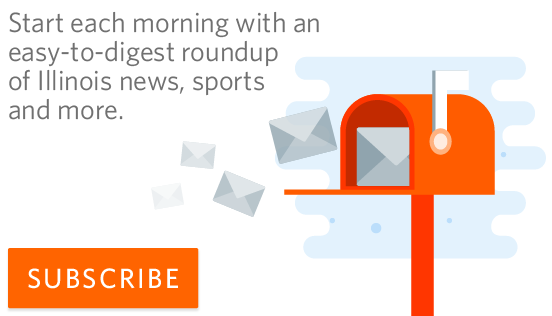 The Illini return the majority of key contributors next season. 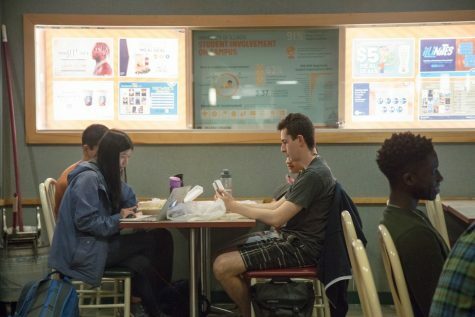 Matt Foster, Joey Peters, Tom Gibbs, Taylor Smith and Marlon Vernon are the five departing seniors.